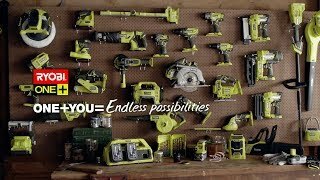 Take on construction and get professional-grade results with the RYOBI 18V ONE+ nailer kit. Each of the 3 tools delivers powerful performance with the on-board AirStrike™ technology. The finish nailer can tackle any airgun tasks without the pain and noise of compressors or air cartridges, delivering up to 750 nails on a single charge. You can expect the same professional standards from the powerful RYOBI ONE+ crown stapler. Both precision and convenience have been optimised with the on-board Grip-Light LED and a belt-hook to suit left- or right-handers. Finally, the brad nailer can deliver 18 gauge brad nails so cleanly they almost disappear from sight. Included with the 3 ONE+ AirStrike™ tools are a 1.5Ah ONE+ battery and fast charger, to deliver professional power in record speeds. With unbelievable power and precision, delivering trade standards from home has never been easier. Grab your RYOBI 18V ONE+ nailer kit from your local Bunnings Warehouse today.